If it is good food, cooked and prepared to order, in a relaxed atmosphere with something for all the family then Potter About is a great place to visit. Why not try ceramics painting on your visit? It is very rewarding for all ages. 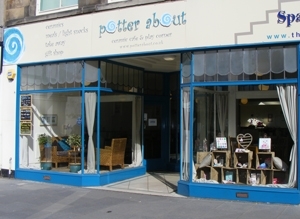 Welcome to Potter About where there is something for everyone to enjoy. Our extensive menu has something for everyone: from build your own breakfasts, lighter meals of sandwidges, toasties and paninis, gourmet burgers and pastas all cooked to our own recipes. All our baking is homemade and scrumptious. We source all our ingredients as locally as is possible. In our ceramics painting area you will find a range of shapes to paint: from coasters and small animals to larger bowls and jugs there is something for all ages to enjoy painting. All of our prices include glazing and firing. We welcome painters of all ability into the cafe and staff are trained to ensure that everyone can reach their creative potential! We have a play corner too for our little visitors: the play kitchen, train set and books are always popular. 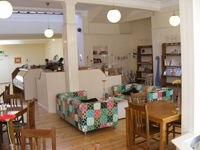 The comfy sofas in this area are just the job for those grandparents ready for a rest...or for nursing mums who need a comfy seat...or for cuddling up to read a story to a little person. There is even a gift and card area to browse in whilst the others paint and play. The cafe is airy, roomy and light. Burntisland is a sea-side town and during the summer is visited by many who enjoy the pleasures of the beach and prom as well as enjoy the traditional show rides resident on the links for the summer. The play parks are popular too; particually the play water fountains on a sunny day. The leisure pool is adjacent to the beach and has flumes and waves to enjoy. If history is your interest then the Museum of Communication, The Heritage Centre and Burntisland Parish Church are all open to the public. Burntisland is a great place for walking; we are on the coastal path. Behind the town is the Binn hill with magnificent view across the Forth to Edinburgh and to the Lomond Hills. Walkers and cyclists are very welcome in the cafe.